An urban elm tree came down somewhere in Denver, and when we cut into it, it was the first time we’d ever seen a pink elm burl. I’d heard about it but I’d never seen a pink elm burl. I took this piece of pink elm burl and I set it on my shelf for about six months, and then I got my new set of miniature hunter hollow tools. With the new tools, I knew I could go to a much thinner wall thickness than I’d ever gone before. This piece has just over 1/16th of an inch wall thickness. I wanted to do a voided burl piece with my new tools, and that’s what happened. As I got to the end, I saw the curve up to the top of the piece and it just didn’t sit well with me. 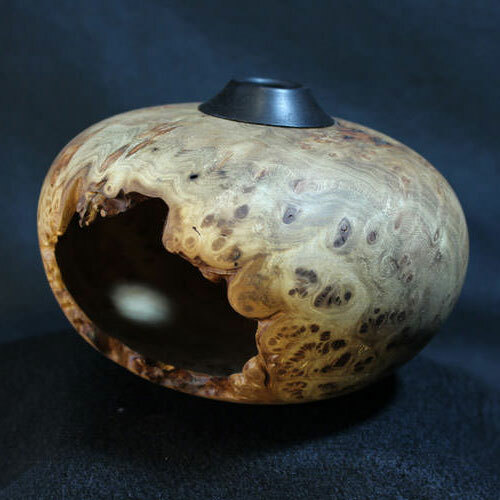 So I threw some african blackwood and shaped it to the exact form I wanted the lip, and fit it into the top of the elm burl, and got the look I was looking for. So this is really a two-part piece. It took a lot of extra time, but it is totally worthwhile to see that form I envisioned in my head when I saw that pink elm burl on my shelf after six months. Please feel free to let me know your thoughts, comments and questions in the comments below.